The mystery fish that turned out to be a Lake Trout on steroids. The double header, 2 species from Wednesday, caught by Johnathan and Josh. 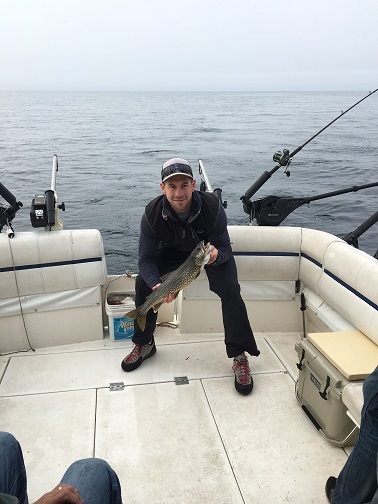 Beautiful Lake Trout from Stannard Rock, caught by Eric. 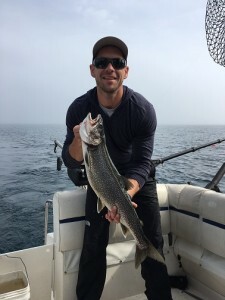 Matt’s nice, dark colored Lake Trout. 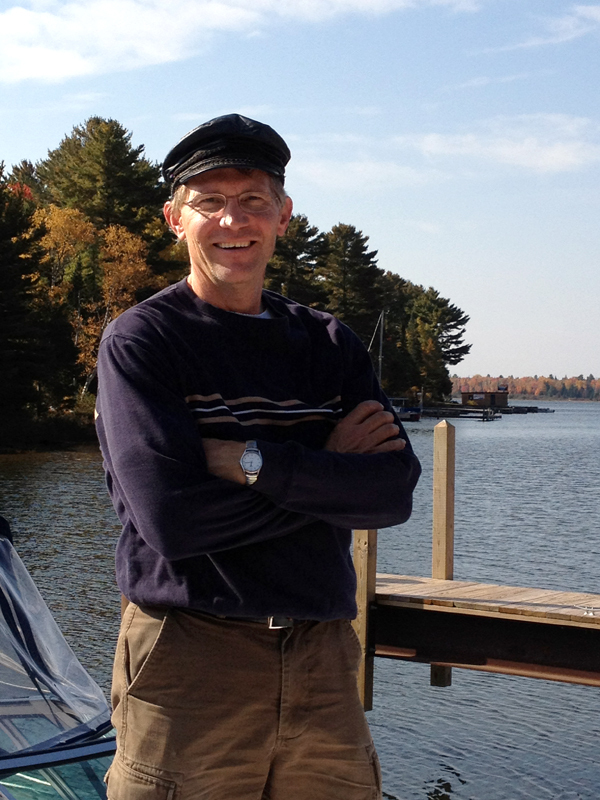 By the number of posts on my website, you’d think I wasn’t even getting out fishing, but it’s been quite the opposite! I’ve been fishing a lot lately – and catching a pretty good mixed bag of Steelhead, Pink Salmon, Coho Salmon, Lake Trout, Splake and Browns. Monday, which was Independence Day, I started off the week just wishing I was fishing, then I got my wish late in the evening as the boys opted out of fireworks in Copper Harbor. I caught a nice Splake and a Lake Trout. The next 3 days were full of fishing excitement with just shy of 40 fish landed, capped off by a day at Stannard Rock. 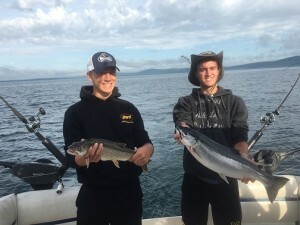 “Double header comin’ in guys,” I shouted as Johnathan brought in a Lake Trout from down deep, and Josh was diving at a bouncing planer board rod with an air-born Steelhead on a Honeybee lure. The trout came in pretty quick and easy as Josh played out the steely for the next few minutes. The only thing more exciting than a double with two different species is a triple with three species at a time. (That’ll be my goal from here on). After landing the two fish, they gladly posed for pictures. That afternoon, I had barber Chris from Milwaukee deep fishing for his limit of Lake Trout, and he also got to land a feisty Steelhead. 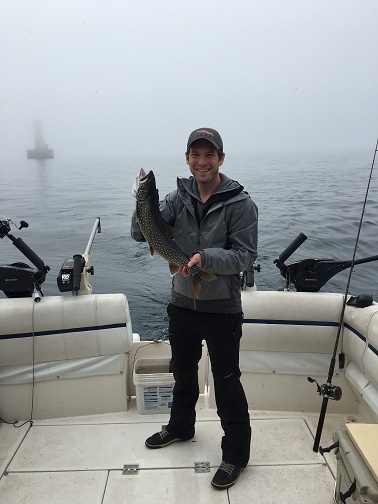 The next day, we all woke bright and early to cruise across 36 miles of a flat lake in the fog, and fished around Stannard Rock Lighthouse all morning. Action was steady as I had Architect-Builder Mark and his three bright sons manning the lines along with my son, Stanley’s help. As we fished, with only glimpses of the eerie lighthouse through the fog, I wondered how lonely it must have been to live here. My thoughts were suddenly interrupted by the sound of a reel spinning as a big Lake Trout pulled out line. As Matt fought the fish, I scrambled to haul in a nearby line that looked like it could interfere with his. After removing the planer board, I reeled like crazy, then stopped when the line was clear, and suddenly there was resistance on my line. “Rats!” I said, as I thought I had snagged onto the tadpole line dragging nearby. Meanwhile Matt’s fish had struggled to free himself, when I realized I had a fish on mine! “Here,” I said to the senior of the trip, “take it.” “No, you bring it in, you haven’t caught any yet.” He was right, as the captain, I don’t get to haul in any fish on a charter. My job is to get my clients on the fish and (usually) hook them up, then hand over the rod. The others seemed to agree, since it was late in the morning and they had all hauled in their share. This fish was truly, unbelievably energetic as I fought him on lead-core line, hooked up with an orange Honeybee. With still 36 feet on my line-counter, he was diving as deep as he could go, bending my pole and peeling line out. “Pull back the throttle to an idle,” I told Stan, who was at the helm. 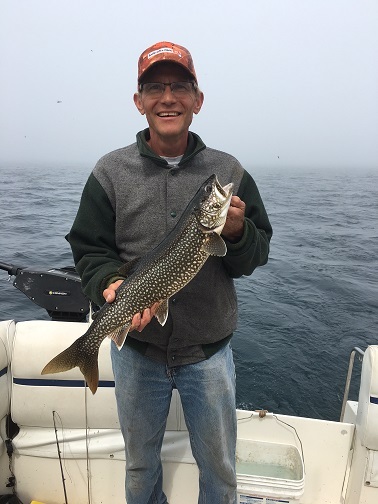 “This is not a Lake Trout,” Mark commented as we got a glimpse of the fish 6 feet below the surface as he tried to dive under the boat. He wasn’t judging by the look, but the fight he had given and I agreed, because he fought the battle of a Brown or a Splake, not a Lake Trout. Another nice, native Lake Trout at the “Rock”. Notice the lonely lighthouse in the background. The only species I’ve caught here at “The Rock” were Lake Trout, Steelhead and Burbot, and it was highly unlikely (almost impossible) you’d find a Brown or Splake out here, I thought to myself. This is not a Steelhead, it’s too dark colored for that. It’s not a Burbot, they are aways at the bottom and they don’t fight like this either. This is either a lonely off-species fish or a Lake Trout on steroids. After one last ditch effort to get under the boat, the mystery fish gave up, was netted and brought aboard – not too big, only about 3.5 lbs, but he surprised everyone because he was a Lake Trout! Not all Lake Trout are created equal – maybe he was pumping steroids!